Teana Lanster is generally a serious person, focused and driven towards accomplishing her goal of becoming an enforcer. She is prone to feelings frustration and inadequacy due to failures and the great talent and special abilities some of the other members of the Riot Force 6 posses. Eventually Teana comes to terms with these feelings and manages to effectively use her own abilities. In the Force she is partnered with her best friend Subaru. Teana's goal of becoming an enforcer stems from the ridicule her older brother received for failure in a mission and thus Teana wishes to show that the bullets of the Lansters are not to be taken lightly. At the end of the series Teana achieves her goal and works as an enforcer under Fate T. Harloawn. Teana uses a Mid-Childa magic system and her intelligent Device Cross Mirage a gun which can be split into two guns. 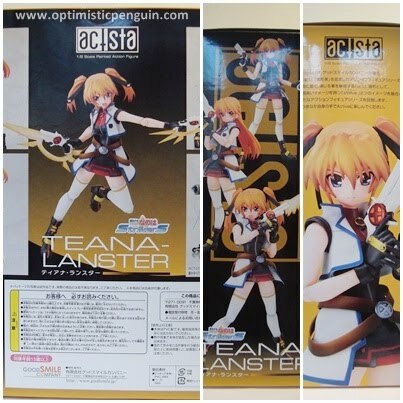 Teana comes in a standard Actsta box. 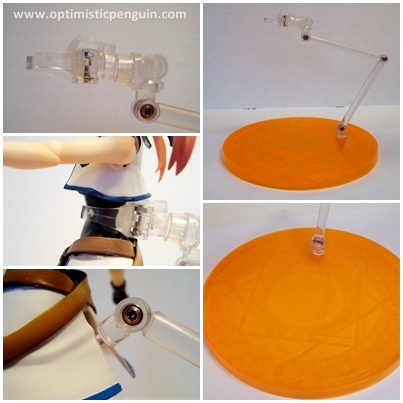 On the front is a window for viewing the figure, on one side is the Actsta logo with pictures of the figure, on the other is a picture of the figure with some detials about the Actsta figure line, on the back there is relevant information, all in Japanese, and pictures of the figure in various poses with their various accessories. Instructions for swapping face pieces and other items are usually printed on either inside of the box tabs or on a piece of paper slipped inside the packaging. Also take note that all figures you purchase have the correct authentication printed or stickered on the box. Inside the box the figure is held between two pieces of moulded plastic, with spaces for their accessories and additional plastic moulding which fits behind the main piece holds the stand and the rest of the accessories. Figures are usually wrapped with plastic in certain areas to protect the paint. Boxes also come with inserts which act as backdrops in the box and can be taken out and used for backdrops while displaying figures. Teana's backdrop is a reflective silver. Teana comes with the standard Actsta stand. Made of clear plastic it has three points of articulation which move forwards and back on hinge joints, one joint is at the bottom where it plugs into the base, one in the middle and one where it plugs into the Actsta, there are also additional pieces for the stand, one bracket piece which plugs onto the end of the main stand and then there is a clip piece which plugs into the other end of the bracket piece, which allows even more dynamic display options, they even include a piece which hooks over the clip piece so that the clip joint will not scratch the figure. The articulation of the stand allows the Actsta to be posed in a variety of dynamic poses, and because it is clear it does not interfere with the aesthetic of taking dynamic and exciting photos. Teana's overall design is very funky, a gun wielding fighter girl with crossed belts waist-coat like jacket and boots. There's something very space western about her character which I rather like. Starting from the top, her hair is nicely sculpted with the ends of her pony-tails and fringe being made of semi-soft PVC so that they do not easily break. Her face is nicely shaped. Her jacket is made of soft PVC and can be removed if you so wished, although then her shoulder joint would show too much and look strange. 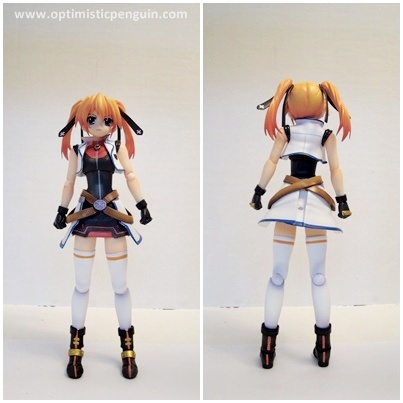 Her torso is covered with a soft PVC and her skirt is made of soft PVC so as not too restrict leg movement. 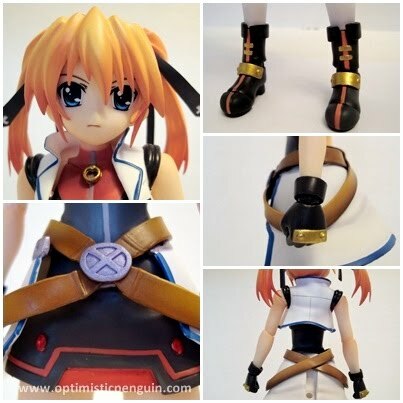 Her belts are then made of semi-soft PVC. Overall her body and clothing has nice depth and layering and she looks very cool. She then has thigh-high socks and very nicely sculpted and detailed boots. All in all a nice shapely figure with functional clothing. Another great sculpt by Good SMILE Company x Liquid Stone. Teana has a colour scheme of white, grey, red and some orange. At first I didn't like the colours of the character but they have slowly grown on me and I rather like her outfit. Once again wonderful paint job on the figure, wonderfully shading on her hair, nice shading on all the folds of her clothing, and on her belts. Nothing much to say except another great paint job. I especially love how the Actsta line give colour to figure by even shading the flesh parts, just wonderful. Teana's accessories are painted fairly well, very few errors, for the most part very good. Teana use’s the standard Actsta joint system. Actsta joints are ball joints with pegs on either end allowing both forward and back movement and rotation. Actsta has six points of additional articulation, in each pony-tail a ball and socket joint allowing her hair to move in all directions, on each part of her outer skirt she has a joint allowing her skirt to move around, and finally a very cool ball joint on the end of her foot, allowing her stand on her tippy-toes. 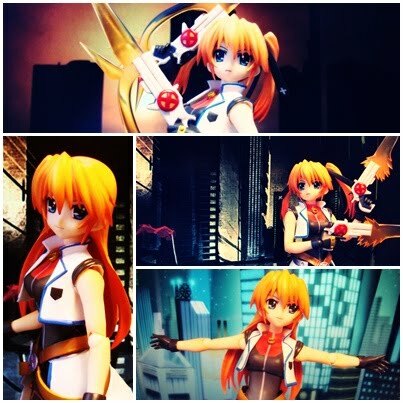 Teana is therefore highly posable and can be posed in a variety of ways. With the use of the accessories supplied, her Intelligent Device Cross Mirage and its various forms, she can be displayed in a number of poses, using her Dagger Blade attack, battle ready with her NAME attack, and she looks great standing next to her best friend Subaru. However there are a few areas in which articulation is restricted due to the back part of her skirt being made of hard PVC her leg movement backwards is some what restricted. Teana comes with three facial expressions; an angry yelling expression, a smiling expression, and a plain contemplative expression . Teana also comes with an assortment of hands; a pair of fists, a pair of open hands for, also for supporting her gun holding hands, and two pairs of holding item hands, one pair with the finger out on the trigger of her guns. Teana also comes with her Intelligent Device Cross Mirage in its single gun form, and her Device also has pieces which can be used to recreate some of her special attacks. 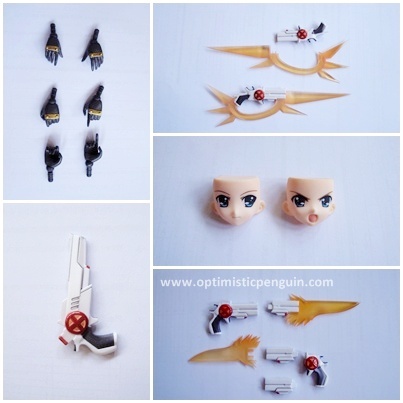 Two semi-clear orange pieces come which attach to the barrel and handle of her guns and these pieces are for her Dagger Blade attack where a magical blade expands itself from the barrel of Cross Mirage. To attach them simply slot its into the handle and peg it to the underneath of the gun barrel. 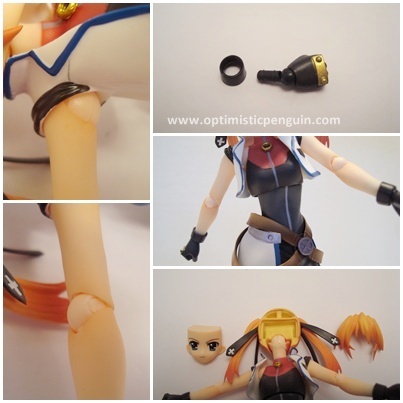 Also there are two more semi-clear orange pieces come which attach to the barrel of her guns and these pieces are for her Shoot Barret attack which is a basic shooting spell in which she compresses magical power into the shape of a bullet and accelerates it and sets it force. To attach them simply unplug the barrel of her guns and attach the new barrel, the daggers can also be unplugged from their barrel as well to create scenes with them being fired. Teana also comes with an extra head piece with her hair down, which is a nice accessory to have. 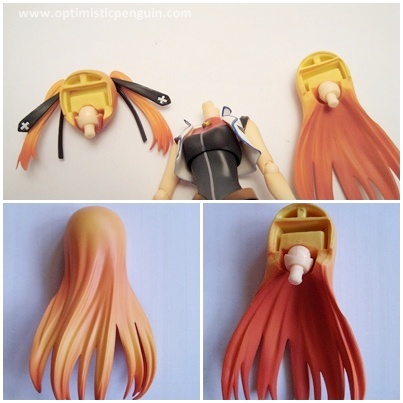 To swap the heads just remove the fringe and face parts and then pull the head off and replace it with the other. Teana is very compatible with other Actsta accessories. Teana can use Subaru's hands and possibly even her rollerblades, and its most likely that she will be compatible with future releases. Next up is a height comparison, as you can see she is on the taller side of the Acsta height scale, and Actsa's are in 1/8 scale and so tower over Figmas and Revoltechs. In general Teana is an awesome figure, she is highly articulated and has a good number of accessories. It seems that Actsta are continuing to improve their figures. As a character she has a lot of attitude and she looks great standing beside her best friend Subaru. Overall Teana I would recommend Teana for anyone who wants to try out the Actsta line but were not interested in Subaru, or for anyone who has Subaru or just loves the character in general. Oh F! I love Teena and seeing Acsta actually made one, just made me raise my respect for the acsta line by a few more points. But I'll go with the figma, since its a bit cheaper. Actsta Teana is a high quality figure. Do you plan to get the figma versions? Nice review! I think this one came out better than the figma. 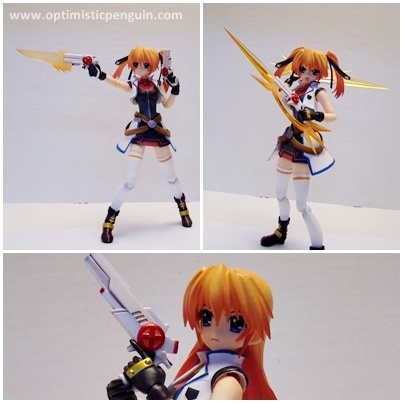 I'll cancel my order for the figma and save up for this one. @ Shewsbury - yeah most likely the joint system takes the best from Revoltech and Figma designs. And its pretty cool having a larger size figure, easier to handle. @ Phossil - no, although a comparison review would be interesting I don't have to money for that kind of thing, plus I don't really want to double up on characters. Nice review on different aspects of the actsta Teana~ A simple glance at it makes it seem as if it's a bigger version of the upcoming figma one, but hopefully the joints are more durable since they're bigger.